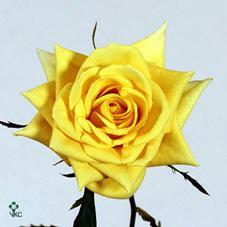 The Skyline Rose is a bright yellow, large headed rose with a fantastically shaped flower. Skyline Roses have a full petal count, strong stems and deep, glossy foliage - a very reliable rose when available on the UK wholesale flower markets. Skyline Roses are wholesaled in wraps of 20 stems. Stem lengths range between 60 and 90cm tall depending on the grade chosen. If you are looking for a large headed bright yellow rose, Skyline roses are a great choice!